On trading these days, any goods can have a crazily enormous range of variations which brings quite a bit of challenge to stock management. It’s such an obviousness that every super-busy online store owner must deeply perceive: Treating them all separately as simple independent products are not the right way, not to mention the wise way to smooth your business cycle. So where lie the solutions? There is a straightforward and common one lying in the phrase “Configurable product” that you guys must be familiar with. A pair of shoes can be varied in different colors and sizes – they are configurable products that bring to customers a few options instead of only the default. Therefore, we can manage all those similar pairs of shoes together more efficiently among a whole ocean of other things in our stocks. On awareness of that importance, Magento 2 allows a website admin to create new configurable products right away, skipping a lot of time spent on creating every single simple product before he can group them up to form configurable products as in Magento version 1.x. Just keep track of the following illustrations, you will find it quite convenient. 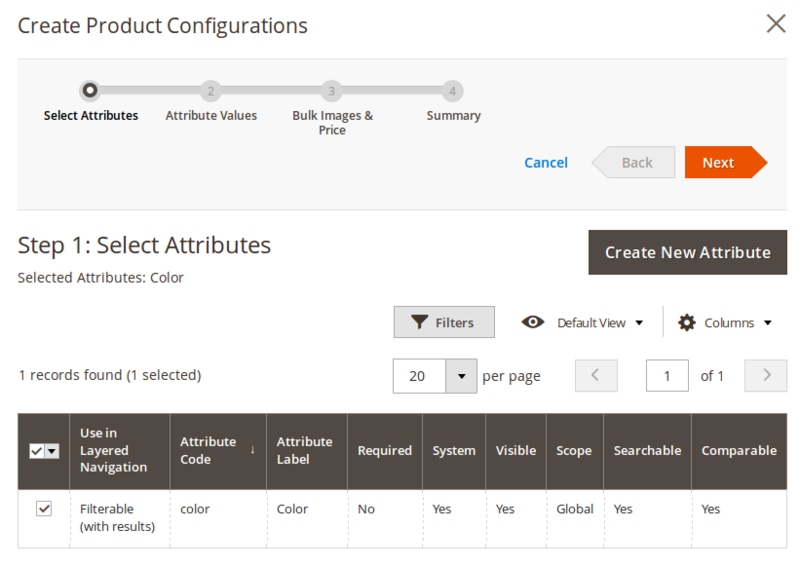 Now you need to select attributes for product details. For instance, color and size are attributes for a pair of shoes. If you cannot find the needed attributes for your products in the given list, just make it shown up by selecting the button Create New Attribute. Then you choose the “Next” button to proceed. Now is the time for you to choose values or creates new ones for product attributes. If color is an attribute then green or yellow are the two possible values of it. 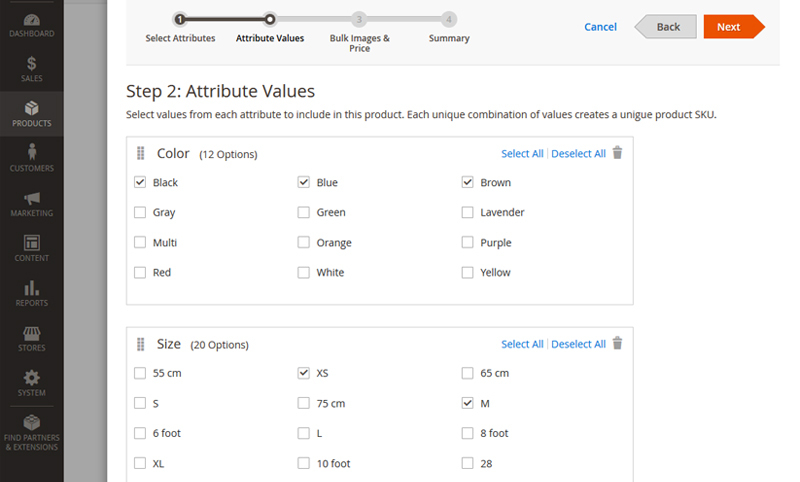 Each combination of values will create a unique product SKU. When finished, you click Next to continue. 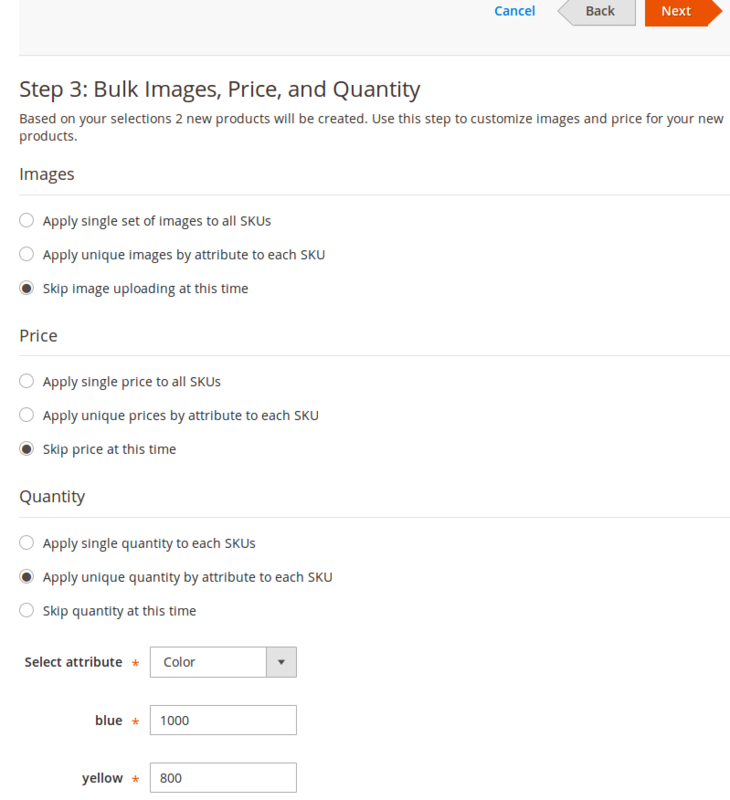 This step will show you options of displaying images, quantity, and price for each unique product. For images, if you select “Apply unique images by attribute to each SKU,” that means different images are displayed for each SKU. Otherwise, if you select “Apply the single set of images to all SKUs,” it leads to no differences in images among all products in the same configuration. It’s applied similarly when you customize price and quantity. 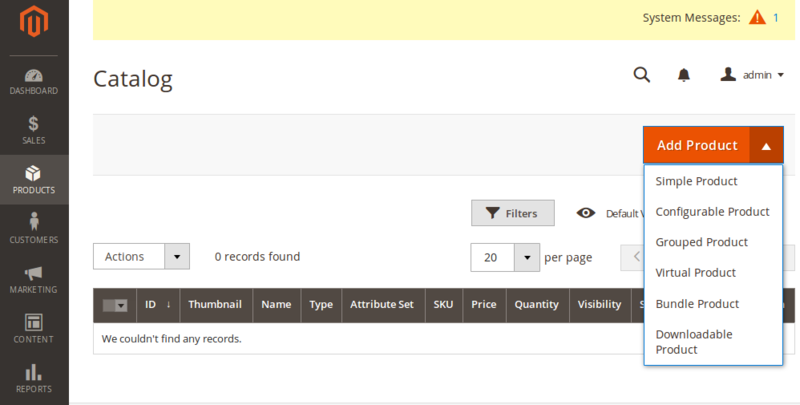 On the summary, it will show you the results of all the customization that you have made until now. Once you click Generate Products, all associated simple products will be created automatically. Click on Save to finish the process. 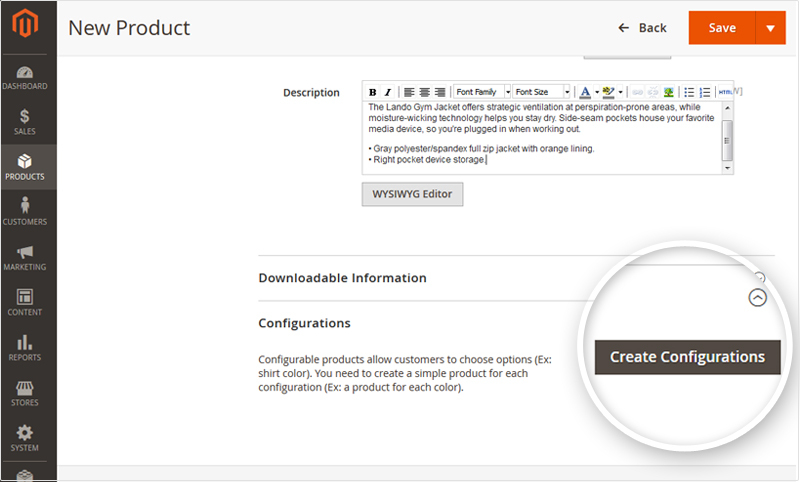 Now you can manage all of them in the Admin Control Panel, Product → Catalog section or go to the frontend to check how it looks. You see, compared to how you create New Configurable Products in Magento 1.x, Magento 2 is about a new, different process for you to adapt even in the same function. So we hope you find this helpful. Besides, also concerning about configurable products in Magento 2, we have been working hard on an extension that offers a better and more convenient solution to display them on your sites. 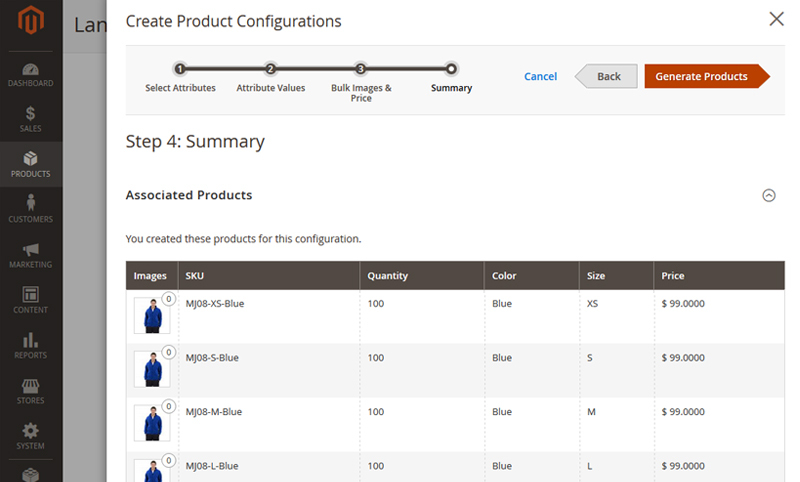 Configurable Product Grid Table View for Magento 2 allows displaying all single options for a configurable product in a neat table which helps customers order more quickly and add to cart multiple items at once. If there is any problem that keeps your mind occupied and is related to Web Development or Magento Extension, please do not hesitate to contact us, we will try our best to help. It’s very useful, thanks a lot. It is detailed and helpful! Thanks for sharing.